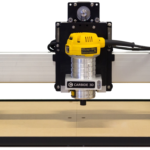 I just did an interview with Zach Kaplan, CEO of Inventables, to learn more about their newly upgraded X-Carve CNC Router. In addition to getting the juicy details about the machine, Zach and I also had a chance to catch up on some other great topics. Hey Zach, pleased to meet you! What’s the Inventables story? I always love to hear a company founder tell me how they got started and what their company is all about. Bob, the original idea for Inventables came to me right out of college.I had a custom software company that made Engineering Change Order Systems for a company making bumpers for trucks and SUV’s. I sold that software company and started thinking about what I wanted to do next. Inventables was the idea I came up with. Tell me more about that original idea? Sure. From ’02 to ’09 we were helping Fortune 500 companies to learn about new materials and technologies. Our idea was to help them create material libraries where their designers could get access to the materials to learn about them. They were especially interested in materials with unusual properties. So, we sold them a subscription service that sent them new materials every month for their library. It cost anywhere from $7000 to as much as $120,000 for a subscription. Wow, that’s really different from where you are today–what changed the formula? Well it is and it isn’t. I was sitting in a meeting, thinking about how the world was changing. Kickstarter and Etsy were starting to get traction. Shopify was out there. The first $1000 3D printer became available–we had industrial grade 3D printers for a long time, but now there were in reach of individuals. I started thinking about how all the energy and excitement around product development was shifting. It was moving from our Fortune 500 companies to tiny little businesses. I wanted to know how we could get involved with those small businesses. What kind of services did they need? I had a “pit of my stomach alarm”–all entrepreneurs know what I mean. I was worried that if we didn’t figure out how to change fast, this new world could pass us by. I know that “Pit of My Stomach Alarm Well,” Zach. What did you do to change? Well, first we started publishing tons of useful information for free. Then, we started to sell the materials piece by piece instead of in subscriptions for material libraries. We wanted to be McMaster Carr for designers to get their materials, with lots of info and same day shipping. Cool. And you’re still doing that. But how did you get into things like the X-Carve? Well, this guy named Bart Dring came to us with these extrusions for making linear slides. He was all psyched up about them, and wanted us to carry them. I was skeptical, I wanted to know how big that market could be for DIY linear slides. Bart said he’d managed to sell $26K in 2011. He showed us an Open Source laser cutter. Then 6 mos later he brought out ORD Bot, which was built with his Makerslide linear rail extrusions, and I started to get it. We started carrying Makerslide in our store and wound up selling enough of it to be as tall as the Sears tower if you laid it end to end. Then Bart introduced us to Edward Ford, who had this machine called a Shapeoko. 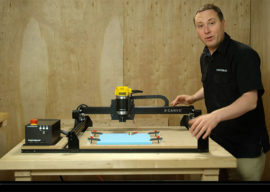 Yeah, I know the Shapeoko and Carbide3D guys, cool machines! 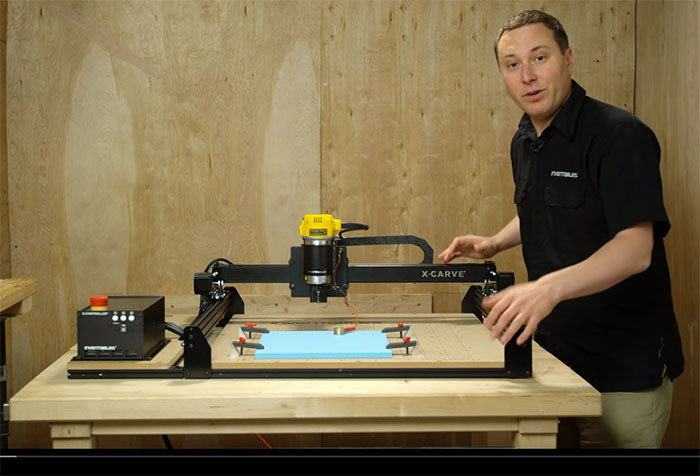 Well, we sold 2 versions of the Shapeoko, and then we lanuched the X-Carve. A year later, we added Easel, our free CADCAM software to it. Then we launched Carvey. X-Carve is a kit and Carvey is fully assembled. Schools buy Carvey–we’ve got some schools that start kids in 2nd grade out making things with it. Using Easel, it can be very easy. At this point, Zach did a demo of their Easel carving software. It’s really slick for carving style projects, and it’s free and super easy to use. Worth checking out! 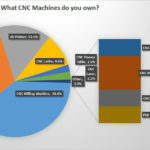 How do you see the whole entry-level CNC market and Maker Movement unfolding in the next 5 years? We’re just trying to make it so everyone can actually do it. 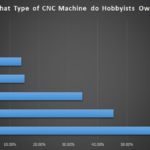 It’s pretty daunting to learn CNC, a lot of it is a software problem, right? We’re really trying to use software at CNCCookbook to make CNC easier. Yeah, it’s a software problem. Plus, we are less focused on Industrial Skills. We want to make it easy for people to just do it without learning all the jargon and such. Helping students go through that journey is a big focus for us. We want to target from 0 (students and kids) to running a small business. At this point, Zach brought up a web site called “Studio Neat“. Studio Neat is a great example of what’s about to happen. There are about 300,000 manufacturers in the US today. That’s going to go to at least 3 million in the next 10 years, and all those new manufacturers will be like Studio Neat. Studio Neat is 2 guys and an X-Carve that they use to manufacture niche consumer products. 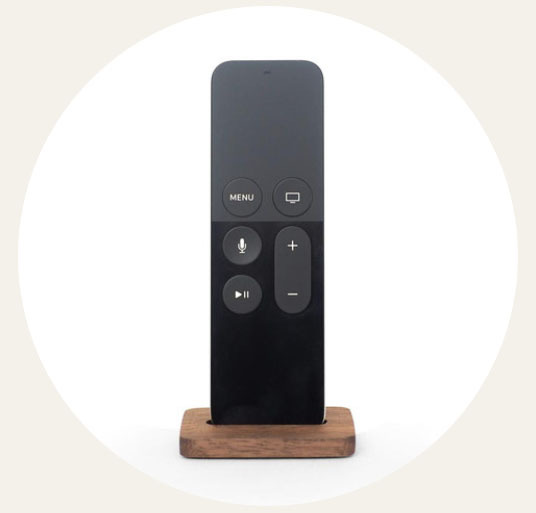 Their first product was this Apple TV remote stand. If you have an Apple TV, you know the remote is so small it is constantly getting lost in your couch. So they made a simple yet elegant stand for it. They had the idea, then 57 days later they were in the market, and they sold 1000 of them their first week. Now they have all sorts of other products too. They’re a hipster consumer products company making specialized consumer products. That’s very cool. I agree, small manufacturers doing niche products is the future. I also think personalization, where every product made will be personalized for whoever bought it, will be big. We all want unique products. What do you think about the new Shaper Tools product? We’ll see, I ordered one, haven’t got it yet. It’s interesting. They sure have been talking about it a long time, and boy has the price gone up over that time. Yeah, I think it’s expected to be like $2000 when it gets past the pre-order stage. So tell me about this new X-Carve. What’s different about it? We spent a lot of time on our forums and interviewing customers about what they would most like us to change about the X-Carve. We decided to make the focus of the new X-Carve reliability. The X-Controller is now standard. We went from having three 1.5 amp stepper drivers to having four 4 amp stepper drivers. This has tthe biggest impact on the gantry where two motors were using 1 driver so they only got 0.75 amps. Overall, there’s 5x more power to run the stepper motors. We also added a heat sink to the motor drivers. You can run the machines for a lot longer without skipping steps. We went to a one-piece gantry with thicker walls and no ribs. It’s much more rigid than the first model. All the wiring is now plug and play, just plug everything in and go. Plus, the plugs and sockets are set up so you can’t plug the plug into the wrong socket. The stepper pulleys are now permanently mounted–no more set screws to come loose. We’re using molded belt clips, and all the hardware is locking. We moved from eccentric nuts to eccentric spacers so you can adjust the machine without taking it apart. 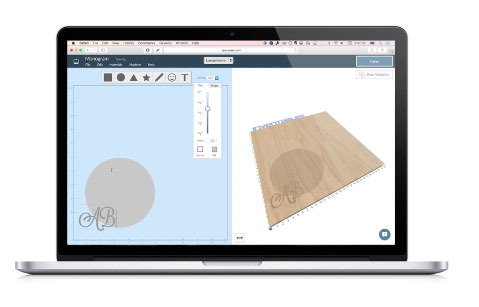 We have GCode import, so you can use more complex CAM packages like Fusion 360. There’s a post processor published so you can set it up for your CAM package, whatever that is. Easel now has a g-code visualizer. You can import and vectorize a jpeg. The simulator will tell you how long it’ll take to run the part. Easel is also now a lot faster–probably 5-6x faster. That means you can run more complex files. We spent a lot of time optimizing the software. All sounds very cool, Zach. Congrats on the new release!